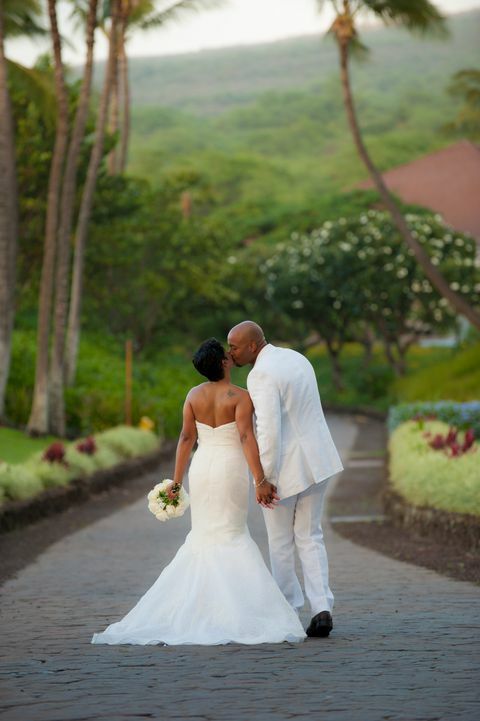 There's lots of Maui beach elopement locations to choose from, from Makena Cove in Makena to Ironwoods in Kapalua. Our favorite beaches are in the Kihei / Wailea / Makena area of Maui including Poolenelena, Maluaka, Paipu, White Rock and Keawakapu. These Maui beach locations offer differing environments, from black lava to verdant palms and tropical plants. The best time of day is morning when the sun is at our back and the deep blue Pacific Ocean shimmers in the background. In addition to the public beaches, we work with a small handful of semi-private venues in the South Maui area. Maui Beach weddings are limited by state law to a maximum of 30 people total, including vendors. Anything above that count will require a a private or semi-private venue which will incur additional fees to your Maui wedding package. Please contact us via email or phone if you are unsure of locations. We are happy to share the mana'o of Maui and can point you in the right direction. 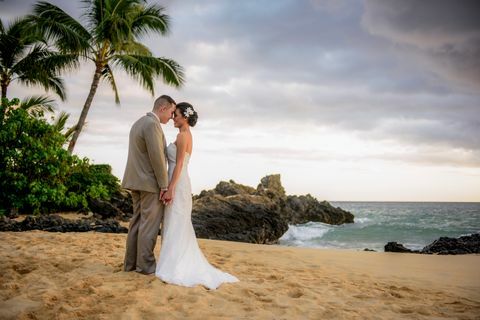 The following locations are beaches suitable for wedding and elopement ceremonies in South Maui. This is not a complete guide but use it as a start to determine the kind of environment you desire for your wedding on Maui. There are numerous sites within each beach that are unique with differing levels of accessibility and amenities. Some beaches are right next to the parking lot, some require walking a narrow uneven trail over lava, others have actual restroom facilities, some have porta potties, a few have limited parking. All of them are spectacular. Makena Cove, AKA Pa'ako (Hawaiian) or Secret Cove, is a very intimate beach south of Makena State Park. It's hard to find as the entrance is a small opening in a lava rock wall along the road, but the trip is worth it. This venue has spectacular dynamic views of Molokini and Kahoolawe with lava, surf exploding along the point, turtles popping their heads up out of the crystal blue ocean, and in season, plenty of Humpback whales breaching. Makena Cove is for small elopements only, maybe a couple of guests but it is not suitable for large groups, extended families etc. If you must have shots at Makena Cove set up a separate portrait session with us. Mornings are best here as it is generally less crowded. Po'olenalena (A.K.A. Chang's) Beach is located in Makena just outside the Wailea resort area. This soft sandy beach is incredibly long with lava rock outcroppings on either end. Local fishermen still cast their lines into the surf and occasionally come up with some pretty large catches. The views of Kaho'olawe and Pu'u Ola'i (Red Hill) are stunning and make for a very cool backdrop. This is a very popular beach for Maui Weddings but it's also very large so there's room to move. So, there's a little bit of confusing information out there on the internet. There's "Secret Beach" and "Secret Cove". In this age of G.P.S. and digital guidebooks, neither of these beaches are secret anymore. While the typical visitor to Maui will probably never find these spots on their own, these beaches are on the location page of every Maui Wedding Planner. Which means there will probably be other weddings happening simultaneously but don't worry, we are all professionals out here and we accommodate each other for the benefit of everyone. Paipu is just north of Poolenlena beach. We use the same perking lot and walk a small, short, rocky path around the point to the beach. Due to the fact that there's an unpaved path, flat shoes are required and all participants must be steady on their feet. Once you get to this insanely beautiful tropical beach location you will be blown away! There's a couple of coves that can be used for weddings and the backdrops are spectacular. Just south of Keawalai church at Makena Landing is the parking area for North Maluaka Beach. This is another killer location and while a tad tighter than South Maluaka, it offers some nice lava rock outcroppings as well as driftwood and views of Pu'u Ola'i, Molokini, and Kahoolawe. Due to the sloping nature of this end of the beach we suggest parties of 10 or less utilize this option. South Maluaka has a nice grassy area on the point above the beach, a beautiful soft sandy beach, lava rocks and a quaint cobblestone pathway that runs the entire length of the beach park bordered with rock walls, grass, and beautiful swaying palm trees. There are a lot of photo opportunities here and it's one of our favorite Maui beach wedding locations. 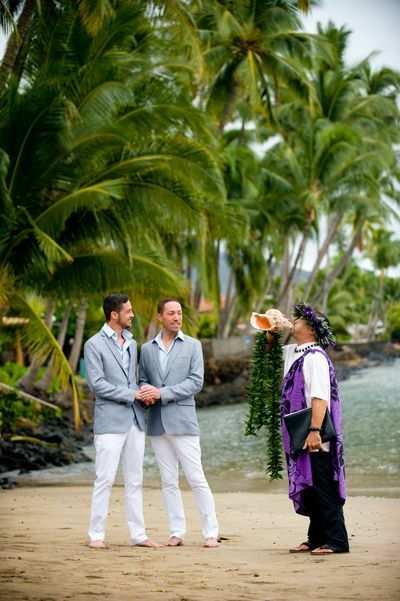 If you're on the west side of Maui, there are numerous options for beach weddings. From Launiopoko Park to DT Fleming Beach, there's a perfect spot for anyone's elopement ceremony. We've put together a short list of our favorite beach wedding locations in Lahaina and beyond. Just outside of Lahaina town proper, a short walk from the center of town lies Baby beach, a short palm tree framed beach with views of the harbor, Lana'i, and the West Maui Mountains. 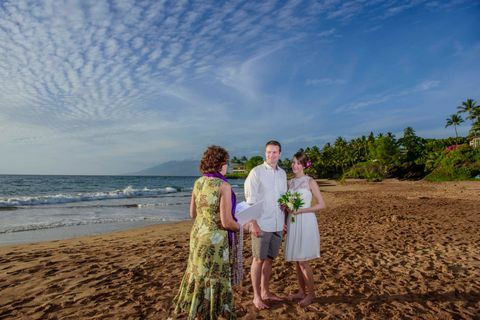 This beach is perfect for a small group or intimate elopement and is very accessible to both Ka'anapali and Lahaina. Restaurants for the post ceremony celebration are numerous and close by. The beach features calm water protected by a reef along with palm trees and rock walls. 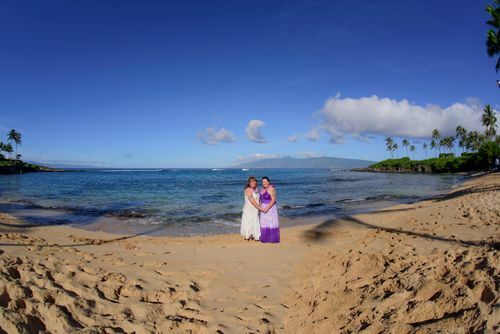 Baby Beach is a very scenic Lahaina beach wedding location and one we love to use as often as possible. As with all Maui beach locations, parking can be a challenge so if you are bringing a group be sure to carpool. Baby Beach in Lahaina is good for a small group of 6 or less.